Since early times mankind invented tools in order to save time and efforts. Those new tools resulted in new processes and products. The steam engine triggered an industrial revolution in factories and mobility. The automobile unfolded its customizable mobility when it became more than just a horse carriage fitted with a combustion engine and when it became a ubiquitous vehicle through the road network. 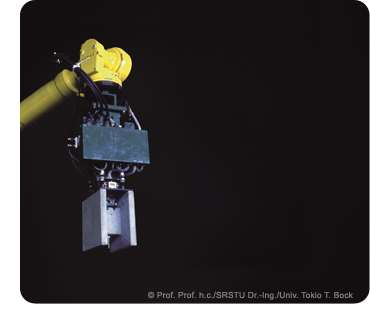 When the first construction robots were developed in Japan they copied typical tasks of construction workers, but the advantage of construction robots was unfolded not before the perimeters in construction such as management, planning, design, detailing, logistics, training, education, quality, attitude, skills, formation, business relations etc. adjusted to the new tool of the construction robot. The notion of ROD or Robot Oriented Design supports not only the efficient use of construction robots, but also helps to improve the productivity, efficiency, and quality of conventional construction methods. ICT, micro system technology, automation, mechatronics, robotics and other technologies increase the value added in all industrial sectors and lead to innovation of traditional sectors. In the construction sector, new technologies are being applied in production of buildings as well as their lifecycle management. The Module Robot Oriented Design is dealing with the transformation of the construction sector by robotics and other new technologies. The goal of ROD is a new kind of design approach applying methods, strategies such as complex relations between programming, conception, implementing, standardizing, modularization, industrialization, assembly, disassembly, reconfiguration, upgrading etc. of built environment. ROD aims at increasing the resource efficiency and performance of any construction or building product or process through the whole life cycle by advanced robotics. In order to achieve this new management, production and product strategies are required.